Some people naturally feel like they have things to prove to the world, or even to themselves. They are constantly working to prove themselves as worthy or valuable, and this can be an ongoing battle throughout their lives. For others there is very little they want to prove, not even to themselves. 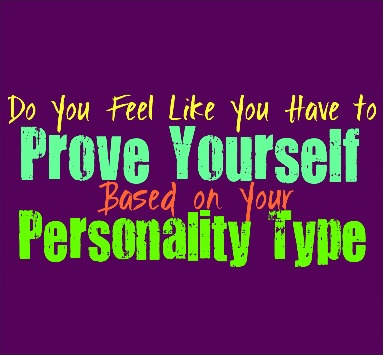 Here is how much you feel like you have something to prove, based on your personality type. INFJs do often feel this internal need to prove themselves, but sometimes it can be hard to really push themselves in this direction. They are usually very hard on themselves and constantly feel like they have something they need to prove. While this can seem to be focused externally, it is actually very internal. The greatest critic and sometimes enemy of the INFJ, lies entirely within themselves. They judge themselves harshly and so often the person they feel a desire to prove themselves to, is really themselves. ENFJs do often feel like they have something to prove, both to themselves and to their loved ones. They care deeply about everyone around them and desperately want to prove themselves. ENFJs work hard to be seen as someone who is nearly perfect, always juggling so many tasks at once. They never seem to stop and breathe, and are always striving to be someone who can impress those around them. This comes from an internal need to be appreciated and loved, but ENFJ definitely find themselves trying to prove their worth. For the INFP any desire to prove themselves does not come from a want to impress others. This comes from a place inside them, and is often tied to their sense of morals. They want to be proud of themselves and strive to feel like they have actually accomplished something of true value. For the INFP being able to make a difference and really prove that they are worthwhile and a good person, is actually really important to them. ENFPs might not appear like they are seeking to prove themselves, but this is often exactly what they are doing. They want to seem like they don’t really care what others think of them, but at the same time they want to be appreciated for what they can do. ENFPs find themselves constantly trying to improve and enjoy seeking out challenges so that they can prove their skills and abilities. ENFPs often possess many talents, but they want the people in their lives to recognize this. INTJs might not even realize this themselves, but they do internally feel like they have a lot to prove. INTJs don’t like the idea of failure at all, instead they strive to be someone who gets it right the first time around. They are actually rather hard on themselves, constantly feeling like they can and should do better. For INTJs the person they are often trying to prove their strengths to, is often themselves. They hold themselves to high standards and are constantly trying to chase after even greater achievements in life. ENTJs definitely feel like they have something to prove, both to themselves and to their loved ones, and even just a bit to their enemies. They want to be someone their family can be proud of, and enjoy feeling like the people around them really appreciate what they do. For the ENTJ it is rewarding to feel like they have proven themselves to the people they care for. At the same time they rarely feel like they have achieved enough, and this comes from their own high standards. Occasionally ENTJs feel a need to prove themselves to their enemies, but this is in a more competitive manner. INTPs do sometimes grow up feeling like they have a lot to prove, and this comes from the fact that most INTPs have heard everyone tell them how much potential they have. Hearing that they are full of potential actually creates more pressure than anything else, and causes the INTP to feel like they need to prove themselves to everyone around them. This can be challenging for the INTP, since deep down they just want to feel a sense of freedom and less expectations from their loved ones. ENTPs don’t often behave like they want to prove themselves to anyone, since this idea can feel a bit draining for them. The pressure of constantly having to prove themselves is something that will weigh the ENTP down immensely. Most of the time they want to feel a sense of freedom in their lives, so that they don’t have to constantly look to others for validation. The ENTP might feel like they need to uphold certain standards, but rarely do they feel like this needs to be proven to anyone else. ISTJs do often feel like they need to prove themselves, both to others and to their own internal judge. They strive to be someone who is both impressive and reliable, and so this comes from a desire to be seen as worthwhile. For the ISTJ it is simply about being able to be seen for what they have accomplished and everything they are capable of in the future. They hold themselves to rather high standards, and are often trying to prove their skills to themselves more than anything else. ESTJs definitely operate on a desire to prove themselves, which can sometimes come from a slightly difficult background. The ESTJ who grew up feeling unappreciated by their family, will likely feel a strong need to prove those people wrong. They don’t like feeling as if they have failed in any way, and so they constantly push themselves to be nearly perfect and always efficient. This desire to be someone others can rely on, does come from a need to prove themselves. ISFJs do feel a strong need to prove themselves, but they want to prove themselves as caring and giving people. They want their loved ones to recognize how hard they work to provide for them, and just how much they value their presence. For the ISFJ it is important that their family recognizes their constant efforts and hard-work. They don’t want to feel like they aren’t doing enough to be recognized by everyone around them. ESFJs do often struggle with this internal need to prove their abilities, both to others and to themselves. ESFJs can be rather hard on themselves, always wanting to be better and impress their loved ones. They work hard to provide for everyone in their lives, almost striving for an unattainable sense of perfection. For the ESFJ it is about ensuring that their loved ones appreciate them, and consider them a person worthy of love and loyalty. ISTPs might find the idea of having to prove themselves to be a bit silly and even a waste of their time. They don’t like investing their energy into proving themselves worthy of others. This type of behavior is likely to leave the ISTP feeling exhausted and overwhelmed. They want to feel freedom to do their own thing and even make their own mistakes in life. There are some occasions where the ISTP does want to prove their skills to themselves, and so they try to constantly take on new challenges. ESTPs often feel a need to prove themselves but only to a few special people. The ones the ESTP chooses to let into their world are often very valuable to them. They can have a hard time feeling worthy of this love and affection, and so they find themselves constantly chasing after it. While ESTPs are fun and adventurous people, they can actually be rather hard on themselves sometimes. This causes them to always push to be better, and to strive to impress their loves ones whenever they can. ISFPs don’t often enjoy feeling this need to prove themselves, especially to their loved ones. They want the people in their life to accept them for who they are, without feeling like they have something they need to prove. For the ISFP it feels exhausting when they have to prove themselves and this isn’t something they feel comfortable doing. They are themselves, and it is nearly impossible for them to change this for the sake of someone else. For ESFPs having to prove themselves to anyone is something that is exhausting and leaves them feeling unhappy. They want to feel free to be themselves and dislike feeling judged by others. ESFPs don’t want to change who they are in order to impress someone, instead they hope to be loved for exactly the way they are. ESFPs don’t often feel a need to prove themselves, since this does not come naturally for them.